This year offered some challenges, with a lot of smoke and a few clouds, but also offered some observing every night. Friday night was quite awesome compared to the others. I had trouble sticking with my observing list, and a couple of times had trouble waking up, but all in all it was a nice event. LM: Briefly as good as 7.1 near Polaris. At worst, -3 (Mars not visible). Seeing: Initially 3/10, improving to 6/10. A real hit and miss night. You know it's bad when my first sketch is of a resolved globular, a pretty daunting task. But, I tried it on M92 while hoping things would get clearer and steadier. I looked at a couple of objects called out by others on the field (NGC 40, NGC 891), and sketched the faint planetary nebula NGC 7139 in Cepheus. The sky was always below expectations, but did get steadier. 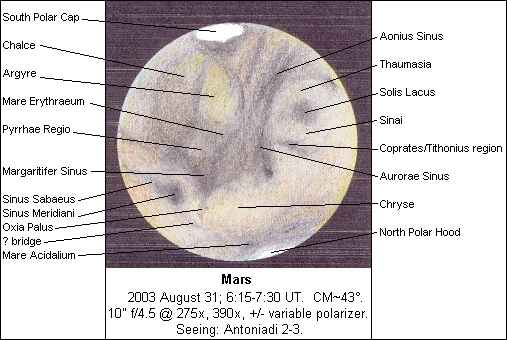 Triton was near eastern elongation from Neptune and easily visible. Oberon and Titania were lined up north of Uranus. Mars was initially poor, but by about 1:30am it firmed up nicely. I started a sketch at 1:40am, but when I was about halfway through the transparency really deteriorated. I had to go down in magnification to keep a bright image, and soon little detail was visible. 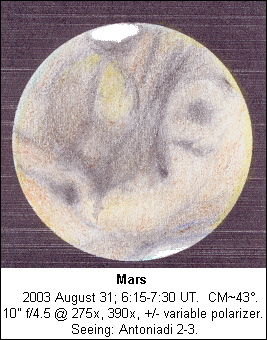 The next morning, I experimented with the partial sketch and found that the OSP dust makes a fine natural pigment and approximates the observed dominant color of Mars. I went to bed at 2:10. I did wake up at 4:16am to find transparency had improved, but decided not to get up. Better luck on night 2? Weather: Heavy smoke rapidly clearing, becoming clear and cool. Moon: Waxing crescent set in twilight through heavy smoke layer. Seeing: 4-7/10, peaking at about 6:00 UT and also nice near end of session. Objects noted: PK36-1.1 (sketch), NGC 6760, NGC 6709, Mars (Deimos [sketch]), Neptune (Triton), Uranus (Oberon, Titania), Jones 1 (sketch), Comets 29P, C/2002 T7 and C/2001 HT50 (all sketched), Saturn, Rosette Nebula, M42 complex, Horsehead complex, M1. A most unexpected night; in evening twilight it appeared to be a complete smokeout with better prospects for socializing than for observing. However, the sky quickly opened up,and the vibrance of the Milky Way made it clear that this would be a classic night. 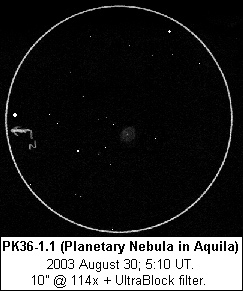 I looked at a few objects in Aquila, including PK36-1.1, an oval planetary with a slightly brighter rim and a faint central star. There was still a lot of smoke in the southwest, so I stayed high in the sky. Mars looked pretty good, but instead of attempting a sketch I tried for the moons. 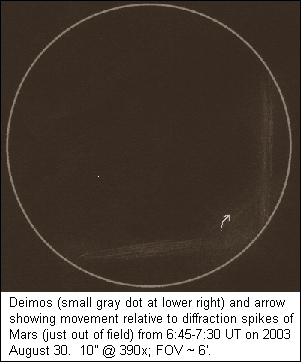 After much effort and waiting for Deimos to clear a diffraction spike, I was able to hold the tiny moon steady with averted vision when Mars was just outside the field of view. Phobos eluded me, though, after an exhausting hour-long attempt. I felt a bit guilty about having spent so much of a good deep-sky night on a planetary project, but at least I was halfway successful. 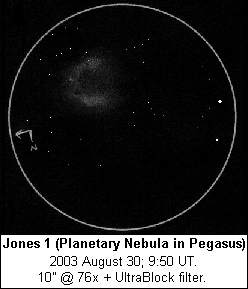 I sketched the large, C-shaped planetary nebula Jones 1 in Pegasus, and recorded 3 faint comets for Astronomical League Comet Club purposes. 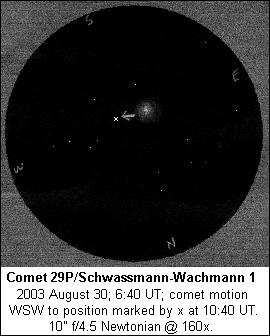 Two of them I had seen before: C/2001 HT50 earlier this year and 29P/Schwassmann-Wachmann 1 back in 1996. The new kid on the block was C/2002 T7. All three were 11th-12th magnitude and lacked tails. After all that, Saturn looked pretty good as well. It took 390x very easily, although small undulations blurred fine detail in the rings. The moons were nicely arranged, with Enceladus popping in and out of view. As a closing act, I took a first glance at some objects of winter. Yes, M42 is back! The Trapezium was great at 275x, with the E and F stars widely split. Moving up to the belt, I could see the Horsehead even though the contrast on nearby NGC 2024 wasn't that great. I tried the UltraBlock filter on the Horsehead; the nebula was still visible, but the view was more pleasing without the filter. I also stopped briefly at the Rosette and Crab Nebulae. I finally trudged off to sleep in my remote car while twilight was brightening. Weather: Smoke near horizons, slowly spreading to cover sky. Saturday night at OSP was a bit strange. I spent twilight helping Scott Turner with his son Aidan's newly won door prize, a 4.5" Bushnell Voyager altaz reflector (think SOD with a mirror). Also, I helped Jenny Forrester identify some of the constellations. And, I played around with my new 2" 32mm wide-field eyepiece. One of the things I noticed was that the emission nebulae M16 and M8 looked really reddish; I confirmed this impression in Scott's 12.5". I have to assume that smoke played a role. The smoke soon thickened, marking this as a night for something other than deep-sky viewing. Luckily, it was the steadiest night of the party. Mars looked really good, with details I hadn't picked up before. What really caught my attention was a faint, thin bridge between Sinus Meridiani and Mare Acidalium, also touching Oxia Palus. There was a nice symmetry to the dark markings overall (see sketch at top of page and labeled version below). When I saw the high-res satellite photos and heard the talks from Howard Banich and Timothy Parker, it blew my mind that when I looked at the Coprates region north of Solis Lacus I was actually seeing part of the Valles Marineris! At 12:30am, the smoke got really thick, so I packed it in. I set my alarm for 3:30, but slept right through it, waking up to a mostly clear but bright sky. Weather: Breezy. Heavy smoke on horizons, coming and going overhead. LM: variable. Seeing: 3-6/10, usually mediocre. Objects noted: Moon (occulting Lambda Virginis), NGC 6702/3, M57, NGC 6939/6946, NGC 7009, NGC 7332/9, NGC 7479, Pegasus I Galaxy Cluster, NGC 507 group, C/2002 T7, C/2001 HT50, NGC 253, NGC 288, NGC 247. It was really surprising how few people remained for Sunday night. Oh, well. It was a more quiet, relaxed atmosphere both during the day and at night with the crowds gone. In twilight, I saw that the Moon was about to occult a star, magnitude 4.5 Lambda Virginis, and alerted folks nearby. Pretty cool. It turned into a variable night. Smoke came and went. I picked a list of objects high in the sky. Even there, transparency was hit-and-miss. The wind was occasionally a nuisance as well. I started off OK, sketching the galaxy pair NGC 6702/3 in Lyra, but soon abandoned my list. 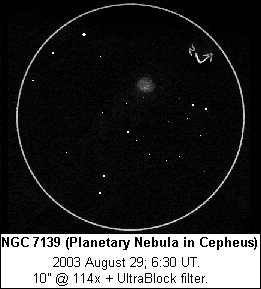 The seeing wasn't very steady, something I noticed when I looked at M57. I started sketching NGC 6946 in Cetus, as I could see spiral structure, but the conditions fluctuated and I found that I was a bit tired. The real highlight was seeing two satellites pass through the field in quick succession. I looked up to see that they were actually part of a NOSS trio. I took a break from DSO observing and compared filtered views of Mars in Mike Powers' 18" (red actually seemed to help tonight), then made the trek to the south end of the 802 road to chat with Chuck Dethloff. When I came back, I was somewhat refreshed. I listened to what Mike was observing, mostly galaxies in Pegasus and Pisces, and sought them out for myself. I could see 8 galaxies in the heart of the Peg. I galaxy cluster, although 2 were very tough and now I see that there were more on the fringes I should have gone after. 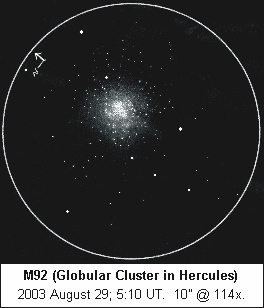 I saw all 13 of the NGC 507 group galaxies labeled in The Night Sky Observer's Guide. NGC 503 was the toughest, being very small. I used 160x on these clusters. If faint stuff wasn't enough, a -4 blue-green fireball streaked overhead and appeared to skip once. I took a look at a couple of showpieces and did my required "second sketches" of C/2002 T7 and C/2001 HT50 for the AL Comet Club. C/2002 T7 looked about the same. 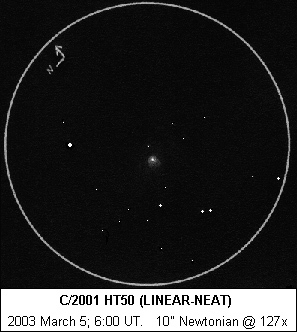 C/2001 HT50 was fainter and more diffuse; I felt lucky to have snagged it. Now, let's have a bright comet! Alas, by 4am it was time to put another OSP to bed.